We want to as the question; what macroeconomic impact does the real exchange rate have. Firstly, we note the real exchange rate is simply a relative price. Just as the relative price of lunch option may impact your decision of what to purchase for lunch, the relative price of domestic and foreign goods affects the demand for these goods. Suppose firstly that the real exchange rate is low. In this case because the domestic economy’s goods are relatively cheap, domestic residents will want to purchase fewer imported goods. For the same reason foreigners will want to buy many of the cheaper goods. As a result of this the quantity of the next exports demanded will be higher. This equation states that net exports are a function of the real exchange rate. The lower the real exchange rate the less expensive domestic goods are relative to foreign goods and thus the greater are net exports. The higher the real exchange rate the more expensive domestic goods are relative to foreign goods and thus the lower are net exports. Note that it is possible for imports to exceed exports and in this case NX will be negative (i.e. less than zero). The real exchange rate is related to net exporters. When the real exchange rate is lower, domestic goods are less expensive relative to foreign goods and net exports are greater. The trade balance (net exports) must equal the net capital outflow (which is savings minus investment). Savings is fixed by the consumption function and fiscal policy; investment is fixed by the investment function and the world interest rate. 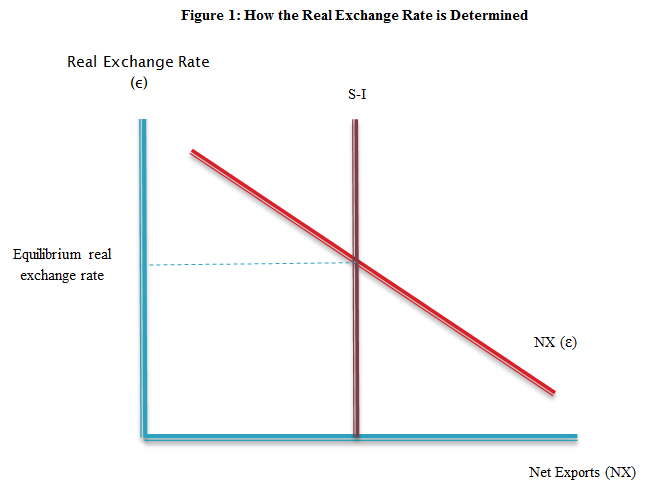 The downward sloping line shows the relationship between the real exchange rate and net exports. This is because low real exchange rates makes domestic goods relatively inexpensive on foreign markets. The line representing the excess of savings over investment S-I, is vertical as neither savings or investment depend on the real exchange rate. The crossing of the two lines determines the equilibrium exchange rate. At this equilibrium exchange rate, the quantity of domestic currency supplied for the flow of capital abroad equals the quantity of domestic money demanded for the net export of goods and services. Figure 1 looks like an ordinary supply and demand framework. In essence, it reflects the supply and demand for foreign currency exchange. The vertical line, S-I, represents the net capital outflow and thus the supply of domestic currency to be exchanged into foreign currency and investment abroad. The downward sloping line, NX, represents the net demand for domestic currency coming from foreigners who want domestic currency to buy goods. At the equilibrium exchange rate the supply of domestic currency available from the net capital outflows balances the demand for domestic currency by foreigners buying net exports. A video tutorial on the real exchange rate can be viewed below.